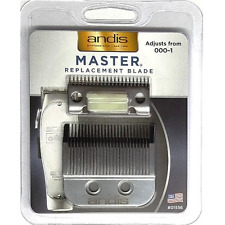 Andis Master Replacement Clipper Blade #01556, ML-22 Adjust. 000-1 Size #22 NEW! MPN: 01410. Andis Small Nano-Silver DOUBLE Magnetic Comb Set (5 piece). Fits clipper models: MBA, MBX, MC-2, ML, MA-1, RACA, PM-1, PM-2, PM-3, & PM-4. Comb Sizes Long lasting, quality magnet will not wear out. Simply replace the steel cutter of a steel blade with a ceramic cutter. Replacing just the cutter part of the blade is much less expensive than replacing the entire blade. Save your money and buy a high quality and durable ceramic cutter blade NOW! Genuine Wahl Lithiun Ion T shaped Blade. This Blade set is a pop-on pre-tensioned blade and should not be taken apart. Deluxe Grooming Station T- shaped Blade Set. Detachable head for models. For optimum performance, clean regularly. Genuine OEM Wahl PartItem Specifications Fits All Wahl Full Size Clippers EXCEPT the Competition Series & Clippers with Detachable Blades. Wahl Part Numbers: 3171-500, 03171-500, 3171. Includes 8 Premium Guards. Comb Sizes #3 - 3/8" (9.5mm). #2 - 1/4" (6.4mm). Ideal for tight curves and intricate shapes with a clean smooth line. Part number: 04535. 1 x 100% CERAMIC TOP BLADE MOD. Simply replace the steel cutter of a steel blade with a ceramic cutter. The high grade ceramic material used will keep your blades running 75% cooler than steel. MPN: 01420. Andis Nano-Silver DOUBLE Magnetic Comb Set (2 COMB SET). Fits clipper models: MBA, MBX, MC-2, ML, MA-1, RACA, PM-1, PM-2, PM-3, & PM-4. Comb Sizes. Specially Prepared For Wahl Electric Clippers. EASY INSTALLATION: This replaces the small moving cutter blade. Can also be used to upgrade steel blades to ceramic blades. Simply replace the steel cutter of a steel blade with a ceramic cutter. SAVES YOU MONEY: Replacing just the cutter part of the blade is much less expensive than replacing the entire blade. This is an Original Wahl 2-hole clipper blade model number 1045-100. 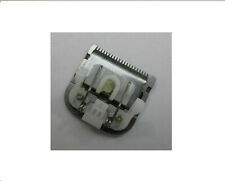 Do not buy cheap imitations always use original Wahl products on your clippers. -100% genuine Wahl blade made in the USA. For Remington HC5150, HC5350, HC5355, HC5356, HC5357, HC5550, HC5750, HC5780. Adjustable from 1/8" (3mm) to 7/8" (21mm). Speed-O-Guide Universal Clipper Comb 3-PK SIZE 0 - 3/16" - 00-1/16" 000 -1/32"
SPEED-O-GUIDE CLIPPER COMB 3-PK, SIZE 0_3/16" _ 00_1/16" 000_1/32". DIRECTIONS: 1. Hook steel spring to the back edge of the clipper blade. Andis Nano-Silver DOUBLE Magnetic Comb Set (2 COMB SET). Fits clipper models: MBA, MBX, MC-2, ML, MA-1, RACA, PM-1, PM-2, PM-3, & PM-4. Comb Sizes TWO MAGNETS for Extra Holding Power. Fits the Andis Cordless T-Outliner, Outliner 2, or GTX blade. Fits behind the blade for the Andis Cordless T-Outliner. Picture is there to show an example where the bracket fits. Item# 20657. This will also fit the Designer, Senior and Sterling 4 Cordless models. Clipper Repair & Sharpening For Andis-Oster- Lister- Double K - Wahl. Huff's Wholesale & Clipper Service. Grab a Bargain . ER-1610 (ER1610). ER-1512 (ER1512). BGR BGRC BGRV Clippers. ANDIS PROFESSIONAL. Fits all Wahl full - size clippers ( except Competition series). with Free Organizer Tray. Model: 3170-400. Feel confident buying from Instant Kinosaki -. Flexing heads automatically adjust to the curves of the face and neck, while the ComfortCut shaving system makes for a gentle glide over your skin to minimize irritation. The Super Lift and Cut dual-blade action lifts hair to cut comfortably close below skin level. Andis Small Nano-Silver DOUBLE Magnetic Comb Set (5 piece). Andis Large Nano-Silver Magnetic Comb Set (4 piece). Fits clipper models: MBA, MBX, MC-2, ML, MA-1, RACA, US-1, PM-1, PM-2, PM-3, & PM-4. Fits clipper models: MBA, MBX, MC-2, ML, MA-1, RACA, PM-1, PM-2, PM-3, & PM-4. Oster Fits A-5--2 Speed and Turbo 1 & 2 Speed A-5 Clippers>>Will not fit 1-Speed A-5. Clipper Repair & Sharpening For Andis-Oster- Lister- Double K - Wahl. Huff's Wholesale & Clipper Service. 1--045515-000-000 Link. 1--041874-005-000 Switch and Field Assembly. Clipper Repair & Sharpening For Andis-Oster- Lister- Double K - Wahl. Oster Fits 1--Speed Classic 76 Clippers>>Will not fit 2 Speed. Huff's Wholesale & Clipper Service. 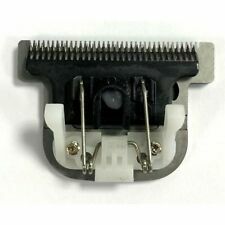 1--042575-000-000 Barber Hinge. 1--045515-000-000 Link. 1--042584-025-000 Carbon Brush set. Your getting all listed below. 9600, 9700, SC, MC, PCMC 2, 9233, 9243. Wahl 1045-100 Universal Clipper Complete Blade Set. About Wahl. Item Number 66240. UPC Code 0 40102 66240 9. Andis US-1 & LCL carbon Blade Set Envy Beauty Master. BEST FOR: Cutting performance on US-1 & LCL model clippers. Carbon steel for long life • Adjusts from 000-1 • Leaves hair 1/50" - 3/32" (0.5 - 2.4mm). Oster Carbon Brush Set Fits all A-5 & Classic 76. NOTE>> You Get 6 Sets Brush Sets For One Price<<<. Item number 6--- 042584-025-000 brush sets. Family Owned Since 1945. Fits on Detachable Animal Blades sizes 8 1/2, 9, 10, 15, 30, 40. Look at picture for 8 different cutting lengths from 1/8" to 1". Andis ML Black Comb Single #0 & #1 Barber Clipper Guards #33660 & #33665. Adds cutting versatility to your Andis Clipper. Fits Clipper Models: ML, US-1, AAC-1, LCL. Comb Size Plastic Clip On Guards. Andis Small Nano DOUBLE Magnetic Comb Set Barber Clipper Guards 01410 "Set of 2"
Rare Earth Magnets easily secure comb to clipper blades. Fits Clipper Models - MBA, MBX, MC-2, ML, MA-1, RACA, PM-1, PM-2, and PM-3. Patent pending magnetic combs infused with nano-silver technology. #1 - 1/8", 3mm. #66345 : Nano Silver Comb Small Set, Sizes: 1/16", 1/8", 1/4", 3/8", 1/2". Rare earth magnets easily secure comb to clipper blades. Small Nano-Silver Magnetic Comb Set. SensoTouch w/ Super Lift & Cut Action For A Sensationally Smooth Shave. After such a workout, even the best materials can lose their edge. Retain your razor'speak performance - replace heads RQ11/52 every 12 months. Andis T-Outliner,Outliner II,T-Edjer,Fade Master Replacement Blade!!! Item# 01420. Andis Master Magnetic Comb Set Size 1/2 (.5)& 1-1/2(1.5). Will fit Andis Master, Fade Master. Will also fit: Oster Fast Feed, Topaz, Speed line. 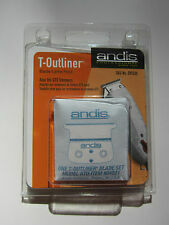 Andis replacement T Outliner Blade NEW!